The Medical and Scientific Division is one of the largest divisions in the Alafia corporate structure. Currently representing more than 20 of the world's major principals, we carry a wide range of healthcare products from the basic medical and scientific suppl ies to the most sophisticated laboratory and clinical equipment. 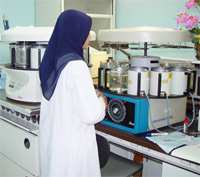 With the quality standards of world-renowned manufacturers and suppliers, and Alafia established expertise in the region, we maintain a distinctive market presence in the field of Medical Equipment, Disposables, Supplies and Scientific Equipment.